If you want more buds and better canopy penetration, you might not need to change your light. First, give Low Stress Training a try. HPS grow light devotees will tell you that HPS penetrates the canopy better than anything else. And it’s true, canopy penetration from HPS is excellent. However, the best, newer generation LED lights can hold their own now. Moreover, HPS lamps have some significant drawbacks: heat, short lifespan, high power consumption, not great for small grow spaces. To name just a few. For small, home grows, LED is just more convenient – and works out cheaper in the long run. But not everyone can afford the top models. And what if you already have an LED grow light and want to get more from it – more penetration, higher yield? That’s where Low Stress Training (LST) comes in. It’s a way of training your plants to grow, shorter, flatter and more evenly so that plenty of light reaches every part of the plant. It helps you make the most of your available grow space. And better still, it encourages your plant to produce more colas – the bits that flower. With little to no stress to your plants. In other words, more yield and more light from exactly the same setup. No light upgrades or HPS necessary. Read on to learn more about how to do it, why it works and the mistakes to avoid. 1 What is Low Stress Training (LST)? 2 Can LST be combined with High Stress Training methods? 4 Can I use LST during flowering? What is Low Stress Training (LST)? Low Stress Training, as the name suggests, covers any non-invasive method for shaping and training how cannabis plants grow. The aim of LST is to improve yield by evening out the canopy, exposing more of a plant to the available light and encouraging it to grow more colas. Unlike plant training methods that involve cutting and pruning, pure LST does not work by strategically damaging the plant. However, by always bending down its main colas, you can gently shape your plant into a shorter, bushier plant with a more even canopy. Light doesn’t have to penetrate so far and more of the plant is exposed to it. All of which helps you make maximum use of your available space and existing setup, without stressing the plant. The other big benefit is, that when you bend a main cola, it causes your plant to grow more colas. The plant reacts as if it has lost its main branch and starts trying to replace it. The old main cola will still continue to grow and ultimately produce buds, but so too will these new growth sites. Can LST be combined with High Stress Training methods? Some experienced growers combine plant training techniques with great success. For instance, in addition to using LST, some growers will also “top” their plants. Topping involves cutting away the upper leaves to help light penetrate lower and expose more growth tips to the light. The idea is that while the node you removed would have become just one cola, the growth tips you exposed below it will now form two or more colas instead. It also tends to make the plant grow shorter and bushier than it otherwise would. Essentially, this all means that when you start LST methods, you’re working with at least two main colas from the start instead of just one. Topping is generally done during the vegetative stage, by removing the very top growth with a cut between the top node and the next one down. This is done when the plant is still relatively young with 4-6 nodes. Topping can give very good results, but any method that damages the plant causes it stress. A stressed plant needs time to recover, which means slightly longer growing times. LST shouldn’t slow down growth much at all. Also, done badly, topping can lead to smaller branches developing with very small colas. And too much stress in general can lead to your plant turning into a self-pollinating hermaphrodite, which could ruin your whole harvest. There are numerous other more high stress methods that growers employ in combination with LST. Screen of Green (SCROG), for instance, is a great hybrid of low and high stress plant training. However, if you’re a beginner, we’d recommend mastering one technique first – and since LST is much lower risk, that’s probably the best place to start. The goal of LST is to create a wide, even branch structure with as many flowering nodes as possible exposed to the light. Also desirable is to support branches as early as needed – because the less energy the plant needs to put into strengthening branches the more it can put into flowering. Achieving this is really as simple as just bending the main cola gently down and away from the centre, exposing as much of it as possible to the light and tying, hooking or weighting it in place. And repeating that whenever main colas start to show themselves. First, wait until you plant has grown three or four sets of leaves. We need the plant relatively young, so that the stem is still supple enough to be bent without breaking it. Break the main stem and you risk killing the plant. Choose your method of holding the branch in place. The important thing is that anything directly touching the plant should be soft enough that it won’t cut into the branch or leaves – avoid string. Many growers use soft gardening wire or plant ties, tied or hooked to the rim of the pot. You can also shape wire into hooks that you can plant into the soil to hold down the branch. Pipe cleaners work well too. When tying the branch, tie it gently at the last internode. This is the area between the last set of leaves and the one before last. You can tie the other end of the tie to a stake, to the pot itself, to a tomato cage or to anything else that’s convenient. (But bear in mind that you may need move the whole pot around at some point, so don’t tie branches to the grow tent, for instance.) When using plastic pots, some growers drill holes in the rim for securing ties to. With fabric pots, you can add safety pins to the pots and secure ties to those. Bamboo stakes planted in the soil can be helpful too. After a few hours to a day, you’ll see that the end of the branch will start to point upwards toward the light. Now, just keep waiting until new leaf sets form. New growth will tend to be on the side of the plant. Whenever you see new side branches heading toward the light and getting taller than others, tie these down in the same way as before. You’re looking to create a star shape (when viewed from above) of branches radiating from the middle of the plant. You’ll generally want to spend time on doing this at least once a week. Once there is no longer room within the pot, you can train long horizontal stems to grow in a curve around the rim of the pot. Or go in a spiral from the start (see pin below). If you’re growing an autoflowering strain, of course, flowering will occur on schedule. However, for other strains, you can initiate flowering either when the plant is about half the height you’d like it to be or when you’ve created a nice flat canopy of the desired dimensions. And what should those dimensions be? Well, that all depends on your grow light. You want to work toward a canopy that will be covered easily by the recommended flowering footprint for your grow light. Can I use LST during flowering? Yes. In fact, you should continue with LST during flowering, at least for the first few weeks. During flowering, your plant will usually more or less double in height, growing rapidly, so you’ll need to keep it in shape. Try to avoid touching new buds as much as you can. Don’t worry too much if you do, though, because it’s difficult to avoid. But after the first month, that’s it, you’re pretty much done with LST. Still keep an eye out for any stray cola that might be blocking light or getting too close to the grow light for its own good and tie back accordingly. But otherwise, you can relax. We’ve covered most of these already above, but here’s a handy checklist of the mistakes to avoid when you start low stress training your weed. Don’t start too late. Branches will be stronger and easier to break. Only bend soft, pliable growth. If a branch feels stiff where you want to bend it, try bending it at a higher node. Don’t use string or anything sharp and thin that could cut into the stems as they grow. If you do “wound” the plant or break a stem while bending, tape it up to keep the wound clean and support the stem. Often, it will recover. Don’t anchor ties to the floor, walls or grow tent, as you may need to move the pot. Make sure that your ties are securely attached, not slipping and scraping against the stem. You may need to distribute the pressure more evenly by tying the branch in more than one place. Try to avoid touching new buds during flowering. Like everything else, it takes a bit of practice and experimentation to get the best from it. But the more you use LST the more you’ll get a feel for it. Higher yields without changing your setup. Control over shape and size of canopy. 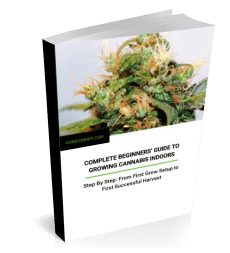 Make maximum use of your grow space – especially ones with low headroom. More even light distribution – low, wide, even canopy; more of the plant exposed to light. Compensate for lights with a good spectrum but low penetration – ideal for those on a budget. Lots of big buds, not just one or two main buds and lots of “popcorn”. More flower from fewer plants. Low stress training is a great way for you to get more out of your existing grow setup, for minimal expense (just plant ties, bamboos, etc.) and with little or no stress to your girls. There’s no recovery time needed. Meaning higher yields without extra grow time. If you’re growing with a budget light, this is the cheapest way to upgrade it. If you’re short of space, LST helps you use it efficiently. And if you’ve got a top end light, LST will get the best out of it. And finally, once you’ve mastered LST, there’s a whole world of other cannabis training tricks and techniques out there, most of which build on or combine with LST to supercharge your growing even further. What’s above is just the very basics. We’ve covered a few here. Check out our guide to grow light movers too—they’re another great way to get more out of your existing lights and better cover your grow space. Feel free to add some more in the comments!